There was once a time when pears from Jedburgh where in high demand. Markets in London simply couldn’t get enough of them. 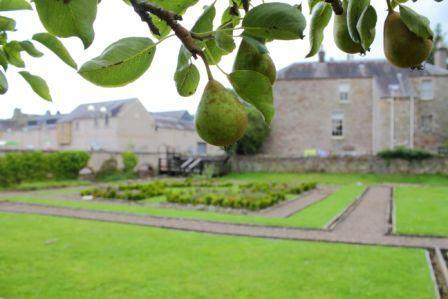 In the late 18th century, every spare piece of Jedburgh land contained orchards of Jethart Pear trees but one hundred years on, the bottom dropped out of the fruit trade. So what happened to all the orchards and the elusive Jethart Pears? The market town of Jedburgh is a Borders settlement that’s steeped in history. Its peaceful ruined abbey dominates the landscape, while the castle jail acts as a reminder of the wars that once savaged the town and the custodial reform system that followed. Fruit growing was first introduced to the town in the 12th century by the Augustinian order of monks who planted French trees in the grounds of the abbey. The abbey gardens were thought to originally span over five acres and it is here, they tended for the trees and harvested the fruit for their own kitchen. In the 15th century, a plot of land to the north of the town was bequeathed by Sir Andrew Ker of Ferniehurst, to a self-sufficient Franciscan order of monks who built a friary. Like the Augustinian monks, the ‘grey friars’ also planted fruit trees. Their close links to the community led them to tend to the sick, educate townsfolk and offer food, including the pears, to the needy. As the years progressed, the town discovered the fertile ground their foundations sat upon. The soil in and around Jedburgh was not only rich in nutrients, but deep, and allowed roots to grow up to ten feet in length. Many residential gardens were positioned on steep embankments and this too, aided the growing process. The ideal growing conditions resulted in heavy crops of sweet, plump pears. So successful were the fruits that orchards began appearing all over the town and the neighbouring area, and so began the one hundred year love affair with the pear. Every spare piece of land was used to grow pears as well as apples and plums. Soon, word spread of the tasty, high yielding pears Jedburgh was producing and before long, money was being exchanged to sample these pleasing delicacies. By the late 18th century fruit growing in Jedburgh had become a lucrative market and pears were transported to London where the cries of ‘Jethart Pears’ from costermongers rang out in the streets. Published in 1876, a paper entitled ‘On Jedburgh Pears’ by James Tate, appeared in volume seven of: ‘History of the Berwickshire Naturalists’ Club’ and investigated the success of pear growing. Tate reported how, during the fruit growing boom, a single Jedburgh pear tree yielded fruit to the annual value of £3.00 sterling, an income equivalent to £5000.00 in today’s money. He also made reference to two trees, which in 1793 produced a staggering 60,000 pears. 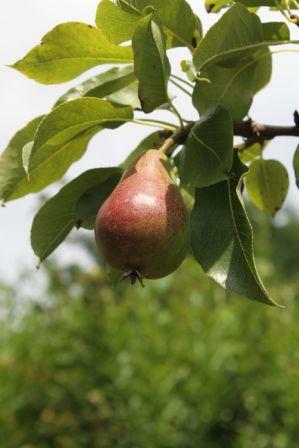 Despite its name, the Jethart Pear actually refers to a number of varieties rather than one single species. The pears are mainly French in origin, most probably descendents of the original trees planted by the Augustinian monks at Jedburgh abbey. The pears produced in the town were predominately dessert pears but other varieties were grown specifically for cooking, although these were less desirable. In 1822, resident, Thomas Shortreed Esq, wrote an account of the remains of ancient orchards in Jedburgh in which he lists pears that still exist or were known to have existed within the area. Twenty five varieties appear on the list including the White Warden, a substantial pear that was striking in colour, and the Lady Lamont, an early fruiting, aromatic pear with a strong taste. For a century, the many varieties referred to as Jethart Pears were grown and sold throughout Scotland and England, putting Jedburgh well and truly on the map. Jethart Pears were once famous for being successful crops grown from ancient forms. However, at the turn of the 20th century the town suffered an enormous blow when their fruit trade began to collapse and forty acres of orchards slumped to just sixteen. These once fertile lands made way for modern living and industrialisation. Jedburgh’s fruit production may have supported local families and brought in substantial profits but now it was fighting a losing battle against large scale fruit manufacturers who could produce pears at a fraction of the cost. Slowly, the town’s orchards made way for factories, shops and houses, and those that were left remained in the shadows of the past. But all is not lost for the Jethart Pear. Scattered around the town are still many descendents of the original pear trees. The site that once housed the Friary, now known as Greyfriars’ garden, proudly displays a few examples, as do many private gardens around the town. A group of local volunteers are in the process of restoring some of Jedburgh’s orchards to ensure its fruit growing history is not forgotten. Established in 2006, the Orchard Development Group has set out to promote and commemorate the pear trees that brought the town so much fame. They assist current orchard owners in the Borders with tasks such as pruning and general maintenance, while offering advice and encouragement. The group has established a special project: The Crailing Community Orchard where many of the ancient varieties of pears, apples and plums are grown. Additionally, in 2007, the group undertook a major survey, where thirty four orchard owners confirmed the size and age of their plots, along with the types of fruit trees established on their land. Sadly, the survey concluded that the majority of Jedburgh fruit now produced goes to waste. However, owners are keen on reintroducing productivity so that their fruit may be put to good use. Maybe, one day soon, we will see the return of the Jethart Pear and hear its name cried from markets stalls once more.